The trouble with social media is that anyone can create an account on any platform. Sometimes, it results in duplicate profiles, or worse, false information that can confuse your community. Some Facebook Page admins have noticed a new “Report Duplicates” module, which allows them to search for related Pages and report those that are unofficial. Facebook will review the duplicates and re-categorize them as Community Pages — which are often built around topics or causes, and are managed by members. Although visually similar to Pages, Community Pages are clearly marked beneath the Page name and will include a link to the official fan Page. 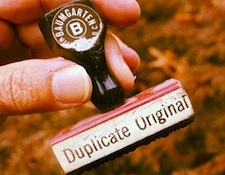 Unlike Twitter and Google+, which both offer some form of verified account status, there’s still no way of knowing whether a Facebook Page is official or a duplicate. While members often use Likes as a gauge, it’s up to you to be on the lookout for the fakes. Leading fans to the proper Page is important. Make sure that your company website and marketing materials have your Page URL clearly marked to make it easier for fans to find you on the social network. Additionally, regular activity and quality content will also help to keep fans on your Page, versus a duplicate.